A pub might seem an unusual theme for a disc of 20th-century choral music but The George (aka The Gluepot) was no ordinary pub. Convenient for the BBC and the Queen's Hall (it was Sir Henry Wood who christened it the Gluepot because his musicians tended to stick there), for a chunk of the 20th century it was a gathering place for British musicians and artists. The composers thus associated are a stylistically diverse bunch, from John Ireland and Arnold Bax through to serialists like Humphrey Searle and Elisabeth Lutyens. It was Lutyens who remarked in her autobiography A Goldfish Bowl, that if a bomb dropped on The George, a large proportion of the musical and literary world would be destroyed. On this new disc from SOMM, Andrew Griffiths and Londinium chamber choir have taken the Gluepot composers as their theme, missing out some (Constant Lambert wrote no unaccompanied choral music) and adding others such as EJ Moeran's friend Peter Warlock, Warlock's mentor Frederick Delius and Alan Rawsthorne's friend Alan Bush. 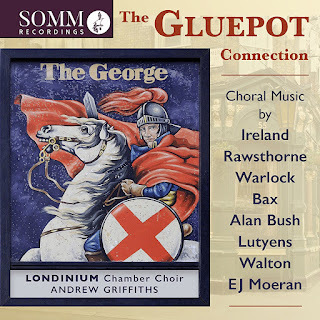 Londinium is a London-based non-professional choir with a formidable reputation and, under the leadership of Andrew Griffiths, a reputation for imaginative programming. And here I must declare an interest, I know a number of members of the choir and count two participants on this recording as friends, singing with them in other choirs. We start with Peter Warlock's early The Full Heart, an evocative setting with a certain bleakness to it, a terrific piece with an interesting harmonic adventurousness. Next comes Alan Rawsthorne's Four Seasonal Songs all setting 17th-century English poets. The first, the rapturous Now the Earth reminded me of early Tippett and the third piece is interestingly chromatic. John Ireland's The Hills is intelligently pastoral with some interesting harmonies yet the piece must have seemed very old-fashioned when it was premiered in 1953. Bax's I sing of a maiden is full of his typical lyricism, lushness of texture and rich harmonies. Alan Bush's Like Rivers Flowing from 1957 is intelligently tonal and beautifully written, whilst Delius' fabulous On Craig Dhu from 1907 is far more adventurous than many of the pieces by younger composers. Thankfully Elisabeth Lutyens Verses of Love from 1970 shows a typically adventurous spirit. A setting of verses by Ben Jonson split between men (He) and women (She), it has jagged outlines to the melodies, note-clusters and yet also an intriguing atmosphere. I have to confess that I find E.J. Moeran's Songs of Springtime a little difficult to enjoy; beautifully written and engagingly performed, the English madrigal / pastoral evocation palls well before the seventh song. Walton's Where does the Uttered music go was written for the dedication of the Sir Henry Wood window at the church of St Sepulchre without Newgate in 1946 (and the location for Londinium's launch concert for the CD). John Masefield's text is unpromisingly wordy and dense, but Walton produces a striking piece with familiar Waltonisms in the harmony. John Ireland's Twilight Night from 1922 is another of his beautifully constructed pieces, a modern take on the part-song. Alan Bush's Lidice come recognisably from the same tradition but its subject, a commemoration of the massacre at Lidice in a poem by Bush's wife Nancy, gives the work a powerful strength. Arnold Bax claimed that Mater ora filium was inspired by Byrd's Mass for five voices, but Bax's extravagant textures are well beyond anything that Byrd might write. It is a big, complex work and Andrew Griffiths takes a controlled and concentrated approach which brings admirable clarity to Bax's richly layered textures in a performance which flows well and never wallows. William Walton – Where does the uttered Music go?